California Highway Patrols investigate a fatal crash on the northbound 710 Freeway in Paramount Tuesday, April 26, 2016. PARAMOUNT, Calif. (KABC) -- All lanes on the northbound 710 Freeway were temporarily closed in Paramount Tuesday morning following a fatal crash involving at least four vehicles, the California Highway Patrol said. 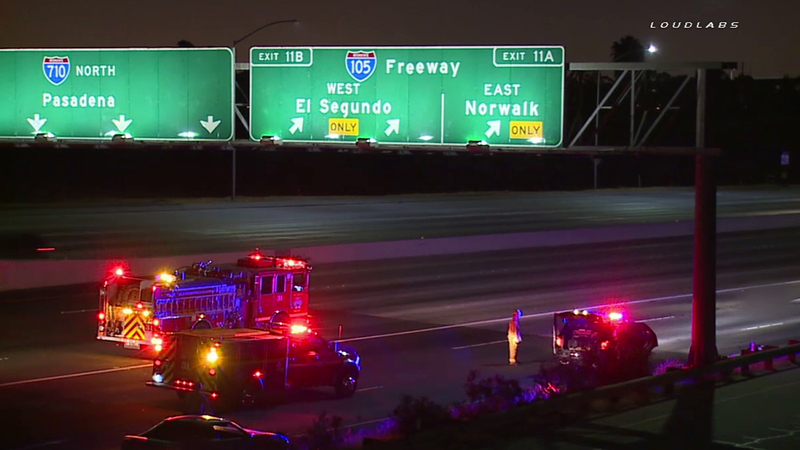 The crash was reported near the Rosecrans Avenue off-ramp around 12:40 a.m. It's unclear if the victim was a passenger in one of the vehicles or a pedestrian. No other injuries were reported. The drive was slow from Alondra Boulevard, the CHP said. Three northbound lanes were reopened around 5:30 a.m. The transition lane from the 710 Freeway to the 105 Freeway will remain closed until further notice.